Glucocorticoid-induced TNFR (GITR) and its ligand, GITRL, belong to the costimulatory members of the TNF superfamily and are crucially involved in the formation and modulation of an effective immune response, comprising innate as well as adaptive mechanisms. In this study, we identify and describe chicken GITR and GITRL, and provide an initial characterization of the newly developed chGITR-specific mAb 9C5. Structural analyses of the putative chicken molecules GITR and GITRL confirmed the conservation of classic topological features compared with their mammalian homologs and suggested the ability of mutual interaction, which was verified via flow cytometry. Whereas only minute populations of native lymphocytes isolated from spleen, bursa, and thymus expressed GITR, it was strongly upregulated upon activation on αβ and γδ T cells, comprising CD4+ as well as CD8+ subsets. In blood, a fraction of CD4+CD25+ T cells constitutively expressed GITR. In addition, virtually all chicken erythrocytes displayed high levels of GITR. Our results verify the existence of both GITR and its ligand, GITRL, in chickens; they provide the basis and novel tools to further characterize their impact within the immune response and reveal the so-far unrecognized expression of GITR on erythrocytes. Members of the TNFR superfamily (TNFRSF) and their respective ligands create a communications system, which ensures the development and homeostasis of lymphoid and nonlymphoid tissues and directs multiple aspects of an immune response (1). Several members [i.e., CD27, CD30, GITR, herpes virus entry mediator (HVEM), OX40, and 4-1BB] provide costimulatory signals within the process of T cell activation and thus constitute integral parts in the formation of the adaptive host defense (2). Most studies focused on their contributions to the activation of αβ T cells, but different groups also reported on their costimulatory effects on γδ T cells, promoting cell proliferation, longevity, and cytokine production (3). GITR, also known as activation-inducible TNFR (AITR) (4) or CD357, is a member of the TNFRSF described only more recently. Because its identification and description by Nocentini et al. (5) in 1997 as a molecule, which is inducible by dexamethasone on the murine T cell hybridoma cell line 3DO, GITR has proven to be a potent costimulatory receptor for different αβ and γδ T cell subsets in mice and humans (6, 7). Like most family members, GITR is a type I transmembrane protein, exhibiting three cysteine-rich domains (CRD) in its extracellular region as the characteristic feature. Its C-terminal, intracellular region shares a certain similarity with 4-1BB and CD27, two other costimulatory molecules implicated in the process of T cell activation (5). Whereas human and murine GITR is expressed on CD4+CD25+ regulatory T cells (Treg) to a great extent, naive effector T cells exhibit the molecule only at basal levels (8). Upon activation, resting CD4+ as well as CD8+ T cells rapidly upregulate GITR, which in turn promotes cell proliferation, cytokine production, and cytotoxicity and reduces their susceptibility to regulatory effects (6, 9). But as reported for CD27 (10), GITR adopts an ambivalent role in the formation of an immune response. Like on effector T cells, the receptor is equally upregulated upon activation on Treg (11). GITR signaling transiently restrains their suppressive activity but at the same time promotes their proliferation (12, 13). Additionally, GITR signals were suspected to display regulatory effects on effector T cells under certain circumstances, because its cytoplasmic domain was able to interact with the apoptosis-inducing protein SIVA (14). The restraining properties of GITR engagement especially appeared upon strong TCR triggering, in which GITR signals resulted in activation-induced cell death of the affected cells (15). Hence, GITR–GITR ligand (GITRL) interactions allow for the formation of an effective immune response but seem to be coevally involved in its controlled limitation (12, 13). The impact of GITR signals is, however, not restricted to the population of T cells. A low level of GITR expression can also be detected in NK and NKT cells in different APC as well as in different nonlymphoid tissues, where expression increases upon activation (16). Its ligand, GITRL, also referred to as AITRL or TL6, was cloned from HUVECs and is a classic type II transmembrane protein (4, 17). Apart from its expression on nonstimulated APC, the ligand can be primarily detected on endothelial cells, where both cell types transiently upregulate GITRL upon activation (17, 18). Furthermore, GITRL seems to be induced on T cells following stimulation (19), which argues for a T cell–intrinsic stimulus to sustain activation via T cell–T cell contact (12), like it is also assumed for OX40L (2). Because of its widespread expression profile, GITR, together with its ligand, GITRL, is able to promote and regulate innate as well as adaptive immune responses in mammals (16). The molecules were also described in the zebrafish (20) and identified in the chicken genome (21) and hence represent an evolutionary conserved receptor–ligand pair. In this article, we report the molecular cloning and recombinant expression of chicken GITR and its ligand, GITRL, characterize their structural properties in comparison with their human and murine equivalents, and demonstrate their binding capability via flow cytometry. By virtue of the generation of the mAb 9C5, specifically recognizing chGITR, we provide an initial characterization of the chicken receptor. Via flow cytometric analyses, we generally confirm the expression pattern reported for mammalian GITR, with the exception of GITR being detectable on virtually all chicken erythrocytes. This novel mAb serves as a useful tool to further uncover the impacts of the GITR–GITRL system in chickens and to learn more about its functional role in evolution. Fertilized eggs of the chicken line M11 were a kind gift from S. Weigend (Federal Research Institute for Animal Health, Mariensee, Germany). The chickens were hatched and reared under conventional conditions at the Institute for Animal Physiology (University of Munich, Germany). The experiments with female birds were performed at the age of 12–16 wk. BALB/c inbred mice were obtained from Charles River Laboratories (Sulzfeld, Germany) and kept under standard conditions at the institute. All experiments were performed in accordance with institutional, state, and federal guidelines on animal welfare and approved by the committee for the Care and Use of Laboratory Animals of the Government of Upper Bavaria, Germany (permit no. 55.2-1-54-2532.0-60-2015). Single-cell suspensions of the spleen, thymus, and bursa were prepared by passing the respective organs through a stainless-steel mesh. Subsequently, the fraction of mononuclear cells of each organ suspension was separated by density centrifugation on Biocoll Separating Solution (Biochrom, Berlin, Germany). PBL were obtained by slow-speed centrifugation, and PBMC were yielded by density centrifugation of heparinized blood on Biocoll Separating Solution (22). Erythrocytes were gained from the pellets of PBL, and PBMC preparations, after discarding supernatants and cloudy layers, were washed several times in PBS and adjusted to 1 × 107 cells/ml PBS. Human embryonic kidney (HEK) 293 cells, COS-7 cells, and the murine myeloma cell line Ag8.653 were cultured in RPMI 1640 medium (Invitrogen Life Technologies, Carlsbad, CA) supplemented by 10% FBS (Biochrom) at 5% CO2 and 37°C. Positively tested hybridoma cells originating from the fusion of murine lymphocytes and Ag8.653 cells were primarily maintained in RPMI 1640 medium with 17% Medium 199 Earle’s (Biochrom), 10% FBS Ultra low IgG Serum (Bio&SELL, Feucht/Nürnberg, Germany), 2% HAT Supplement 50× (Invitrogen Life Technologies), and 1% penicillin/streptomycin (Biochrom) at 5% CO2 and 37°C for 2 wk. Subsequently, they were cultured in RPMI 1640 medium with 17.2% Medium 199 Earle’s, 10% FBS Ultra low IgG Serum, 1% HT Supplement 100× (Invitrogen Life Technologies), and 1% penicillin/streptomycin at the same conditions for another 2 wk, after which cell clones were maintained in RPMI 1640 medium supplemented by 10% FBS Ultra low IgG Serum. For immunization and primary screening of hybridoma supernatants, chicken splenocytes were cultivated at a density of 106 cells per well in a 96-well flat bottom plate at 40°C and 5% CO2 in RPMI 1640 medium with 10% FBS, 1% penicillin/streptomycin, and a combination of recombinant chicken IL-2 and IL-12. Cells were maintained for 1–2 wk before harvesting. Every second day, 50% of the volume per well was substituted for new stimulation medium. Chicken cytokines IL-2 and IL-12 were generated as reported before (23). For kinetics of 9C5 staining on activated splenocytes, IL-2/IL-12 cultures were prepared as described and incubated for 24, 48, and 72 h without a change of medium. For the activation by immobilized anti-CD3 mAb, splenocytes were seeded at a density of 106 cells per well in a 96-well flat-bottom plate, which was previously coated with a mouse anti-chicken CD3 mAb (10 μg/ml; SouthernBiotech, Birmingham, AL). Cells were then maintained at 40°C and 5% CO2 in RPMI 1640 medium with 10% FBS and 1% penicillin/streptomycin for 24, 48, and 72 h.
The genomic sequence of chGITR was identified by keyword search in the gene database of the National Center for Biotechnology Information (https:/www.ncbi.nlm.nih.gov/), whereas the gene of its ligand, GITRL, was identified by virtue of shared synteny with the genes PRDX6, TADA1, TNFSF4 (OX40L), and TNFSF6 (FASLG) within the respective genomic locations in human and mouse. We confirmed their correct annotation by comparing mRNA and protein sequences of chGITR and chGITRL to their mammalian and avian homologs in the database using the Basic Local Alignment Search Tool (BLAST). We further analyzed the structural properties of the presumed amino acid sequences of chGITR and chGITRL using the Simple Modular Architecture Research Tool (smart.embl-heidelberg.de). All alignments of the respective protein sequences were performed using the Clustal Ω method in the DNASTAR Lasergene software package. Primers were designed based on the sequences of chGITR (accession no. NM_001030874.1) and chGITRL (accession no. XR_001467739.2) and purchased from Eurofins Genomics (Ebersberg, Germany). All oligonucleotides are displayed in Table I. The full-length sequence of chGITR was amplified via PCR on cDNA of Con A–stimulated lymphocytes using the primers 2122 and 2123. The obtained PCR product was further cloned into the pcDNA3.1/V5-His-TOPO vector, applying the pcDNA3.1/V5-His-TOPO TA Expression Kit (Invitrogen Life Technologies). The resulting plasmid served as a template for a construct of chGITR, tagged by a c-Myc tag (henceforth solely “Myc-tag”). It additionally allowed for stable surface expression on HEK 293 cells and was generated as described before (24). Briefly, a modified pSBbi-GP vector provided the source for the GITR-Myc construct. It comprised a gene coding for GFP (25) and the genes for the hemagglutinin of influenza A virus–signal peptide linked to the Myc epitope (24). The chGITR-pcDNA3.1/V5-His-TOPO plasmid served as template for chGITR amplification. The primers 2149 and 2150 created overlaps with their designated vector arms (Table I, underlined sequences), allowing for direct cloning of chGITR into the Myc-encoding pSBbi-GP vector using the Gibson Assembly Master Mix (New England BioLabs, Frankfurt am Main, Germany). To obtain the full-length sequence of chGITRL, we performed a PCR with the primers 2115 and 2116 on cDNA of the chicken HD11 macrophage cell line. The resulting sequence was further cloned into the pcDNA3.1/V5-His-TOPO vector. For the soluble variant of the chGITRL extracellular domain, tagged by a FLAG-tag, we applied a variant of the pCR3 vector (Invitrogen Life Technologies), encoding the hemagglutinin of influenza A–signal peptide and a FLAG epitope at 5′ (vector PS167, kindly provided by P. Schneider, University of Lausanne, Epalinges, Switzerland). 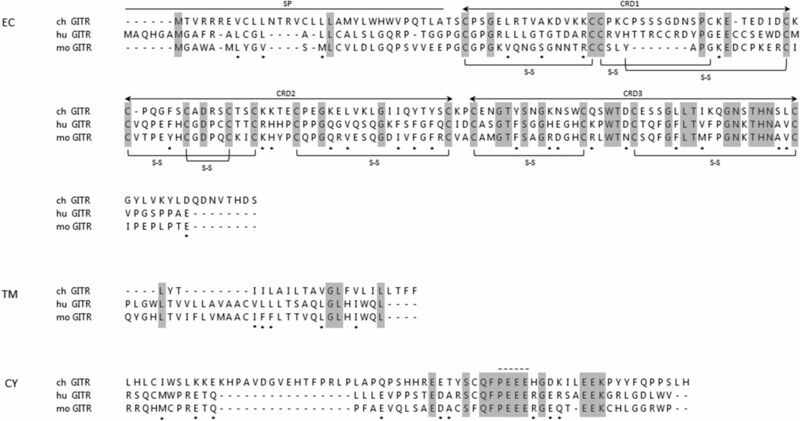 The extracellular domain of chGITRL was amplified by PCR on the chGITRL-pcDNA3.1/V5-His TOPO plasmid using the primers 2113 and 2114, which contained complementary sequences to the 5′ and 3′ of the target vector (Table I, underlined sequences). Subsequently, the obtained sequence was cloned into the FLAG-encoding vector via Gibson Assembly. All constructs were verified by sequencing (GATC Biotech, Konstanz, Germany). We established a HEK 293 cell line stably expressing the surface-bound chGITR-Myc molecule (293-GITR-Myc) by cotransfecting cells with the GITR-Myc–encoding vector (0.665 μg) in combination with a transposase-encoding vector (0.035 μg) using Metafectene (Biontex Laboratories, Munich, Germany). After a 24-h incubation in RPMI 1640 medium in a 24-well plate (37°C, 5% CO2), transfected cells were seeded in a 96-well flat-bottom plate and selected with puromycin (1 μg/ml) (Merck, Darmstadt, Germany) for plasmid uptake. Eleven days posttransfection, cell clones were screened for their Myc-tag surface expression by flow cytometry (FACSCanto II; Becton Dickinson, Heidelberg, Germany). To select GITR-Myc–expressing clones, we applied the mAb 9E10, specifically recognizing the c-Myc tag (Invitrogen Life Technologies), followed by a goat anti-mouse IgG1 human ads-allophycocyanin mAb (SouthernBiotech). To gain the soluble ligand, COS-7 cells were stably transfected with 0.7 μg of the GITRL-FLAG–encoding vector using METAFECTENE. After 7 d of selection with 0.8 mg/ml G418 (Biochrom), the supernatants were screened for the presence of fusion proteins via an anti–FLAG-M2 Sandwich ELISA and affinity purified on an anti-FLAG M2 Affinity Gel (Sigma-Aldrich, St. Louis, MO). Total RNA of 107 chicken erythrocytes from heparinized blood was extracted using TRIzol reagent (PEQLAB Biotechnologie, Erlangen, Germany) and reverse transcribed into cDNA with the ThermoScript RT-PCR kit (Invitrogen Life Technologies). The obtained DNA was subsequently tested for the presence of chGITR DNA via Easy-A High-Fidelity PCR Cloning Enzyme (Agilent, Santa Clara, CA) using the chGITR specific primers 2122 and 2123 (Table I). The following parameters were applied: 2 min of initial denaturation at 95°C, 35 cycles of 40 s at 95°C, 30 s at 56°C, 1 min at 72°C, and a final extension time of 7 min at 72°C. The amplification of chicken β-actin on the obtained cDNA served as internal control. Subsequently, the PCR amplificates were separated by gel electrophoresis (120 V, 57 min) on 1% agarose gels (PEQLAB Biotechnologie) in 0.5× TBE buffer and visualized by SERVA DNA Stain Clear G (SERVA Electrophoresis, Heidelberg, Germany) using the ImageQuant 300 Imager (GE Healthcare, Buckinghamshire, U.K.). The murine mAb 9C5 (IgMκ) was generated by repeated immunization of a BALB/c mouse with 107 activated splenocytes (IL-2 and IL-12) following standard fusion protocols (26). Supernatants of the resulting hybridoma cell lines were primarily screened on activated splenocytes, and reactive mAbs were selected for a further screening on chGITR-Myc–transfected HEK 293 cells revealing the specificity of the mAb 9C5 for chGITR-Myc. To exclude binding of the mAb to the c-Myc tag, supernatant of 9C5 was tested on Myc-expressing cells, yielding no positively stained cell populations. Subsequent flow cytometric analyses were performed using the supernatant of the hybridoma cell clone 9C5. We confirmed surface expression of chGITR-Myc on transfected cells by staining with the mAb 9E10 specific for the c-Myc tag in combination with a goat anti-mouse IgG1 human ads-allophycocyanin mAb. To demonstrate the interaction of the soluble ligand with its cell-bound receptor, 293-GITR–Myc cells were stained with GITRL-FLAG, followed by a mouse anti-FLAG M2 mAb (Sigma-Aldrich) and a goat anti-mouse IgG1 human ads-allophycocyanin mAb. As negative controls, cells were solely stained with secondary mAb or with an unrelated FLAG-tagged chicken protein and secondary mAb. Single-cell staining with 9C5 on 293-GITR–Myc cells and primary chicken cells were performed with the supernatant of 9C5, followed by a goat anti-mouse IgM human ads-allophycocyanin mAb (SouthernBiotech). For multicolor staining, the following mAbs were used, specifically recognizing different leukocyte markers: TCR1 (γδ T cells) (27), TCR2 (VαVβ1 T cells) (28), TCR3 (VαVβ2 T cells) (29), 2–6 (CD4) (30), 3–298 (CD8α, mouse IgG2b) (31), 28–4 (CD25, mouse IgG3) (32), 16–6 (CD45, mouse IgG2a) (22), KUL01 (monocytes and macrophages) (33), and F21-2 (MHC class I) (34). All mAbs were mouse IgG1 isotypes unless indicated otherwise. For double- and three-color staining, cells were primarily incubated with a combination of mAbs and subsequently stained with fluorochrome-labeled Abs according to their respective isotypes. As secondary reagents, allophycocyanin-, PE-, or FITC-labeled goat anti-mouse mAbs were used according to the isotype of the primary Abs (all purchased from SouthernBiotech). For each staining, appropriate isotype-matched controls were applied. Propidium iodide (Sigma-Aldrich) or Fixable Viability Dye eFluor 780 (eBioscience, Frankfurt am Main, Germany) served to assess cell viability. Flow cytometric analyses of living cells were performed on FACSCanto II using the BD FACSDIVA 6.1.3 software. In case of transfected cells, dead cells were excluded by live/dead staining, and viable cells were gated for analysis. For the three-color staining of PBL, we pursued the following gating strategy: via forward scatter and side scatter values, the cell population of lymphocytes was selected and analyzed for its viability by its eFluor 780 dye affinity. Subsequently, living lymphocytes were further screened for their CD4 and CD25 surface expression, and the subpopulation of CD4+CD25+ T cells were analyzed for their GITR expression in comparison with an isotype-matched control. For the analysis of chicken erythrocytes, gates were selected according to forward scatter and side scatter values to exclude leukocyte populations from the analysis. The uptake of propidium iodide subsequently served to assess cell viability and to limit the analysis of single and double staining to living RBCs. For all other stainings, lymphocytes were gated according to their forward scatter/side scatter characteristics, and dead cells were excluded by viability dye. All experiments were performed at least three times with consistent results, in which each experiment was conducted with an individual female chicken. The figures depict one representative experiment. Keyword search in the chicken genome assembly Gallus_gallus-5.0 via National Center for Biotechnology Information revealed the annotated gene of chGITR on chromosome 21. We verified its correct annotation by comparing the deduced chGITR RNA and protein sequences to their mammalian homologs via BLAST searches. The chicken genes encoded 258 aa (GITR) and 181 aa (GITRL) polypeptides, respectively. Structural analyses of chGITR displayed its type I transmembrane topology with an extracellular domain of 168 aa (including a signal peptide of 32 aa), a transmembrane region of 23 aa, and an intracellular domain of 67 aa (Fig. 1). The chicken molecule shares an overall identity of 27.5% with its human (huGITR 241 aa) and of 21.2% with its murine equivalent (moGITR 228 aa), in which most conserved residues are located in the extracellular region of the molecules. In all three species, the ectodomain contains three CRD, which represent the characteristic feature of TNFRSF members. As reported for human and murine GITR (16), the CRD of chGITR exhibit a conserved serial organization of cysteines and distinct residues as a framework, which is filled with additional amino acids. Whereas chCRD2 and chCRD3 perfectly match the sequential arrangement of cysteines and cysteine-substituting residues as well as the formation of disulfide bridges with the mammalian GITRs, chCRD1 differs from the human and murine sequences. In contrast to the first mammalian pseudorepeat, it more strongly resembles the canonical motif of a CRD, exhibiting six regularly spaced cysteines, which form three disulfide bonds. As for the transmembrane and intracellular domain, chGITR shows only weak similarity with its mammalian homologs. All three molecules, however, display the major conserved TNFR-associated factor (TRAF) 2 binding motif (P/S/A/T) × (Q/E) E (35) within their cytoplasmic domain. Upon ligand binding, the latter is essential for the GITR molecule in mammals to transduce signals via different TRAF proteins and to finally enable costimulatory effects like proliferation and cytokine production. Amino acid sequence alignment for GITR. Extracellular (EC), transmembrane (TM), and cytoplasmic (CY) domains are specified accordingly, and species are referred to as ch, chicken; hu, human; mo, mouse. Identical residues are shaded in gray; asterisks (*) indicate residues sharing similar properties. The signal peptide of chGITR (SP) is highlighted by a line and chicken CRD1-3 by arrows above the sequences. Note that the signal peptides of human and murine GITR solely comprise the aa 1–25 and 1–19, respectively. 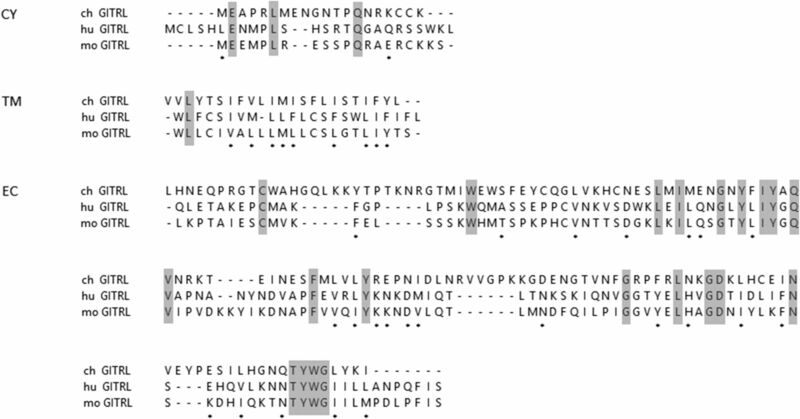 Presumed disulfide bridges within the chicken CRD are indicated as S-S below the sequences. The major conserved TRAF2 binding motif is marked by a dashed line. Accession numbers (https://www.ncbi.nlm.nih.gov/): chGITR MH492023, huGITR NP_004186.1, and moGITR AAB81243.1. To verify the correct attribution of the obtained sequence as the chicken homolog of human GITR, the protein sequence of chGITR was aligned to huGITR, as well as to three other human costimulatory TNFRSF members, namely OX40, CD27, and HVEM (Supplemental Fig. 1). As expected, the alignment and the homology levels (chGITR–huGITR 27.5%, chGITR–huOX40 16.2%, chGITR–huCD27 15.8%, and chGITR–huHVEM 14.4%) confirm that the chicken amino acid sequence is more closely related to the human GITR molecule than to other human proteins of the costimulatory TNFRSF members. Additionally, the comparison of chGITR and huGITR protein sequences to available sequences of the GITR molecule of three other birds (helmeted guineafowl, Japanese quail, and turkey) demonstrates their structural similarity, especially between the avian proteins (Supplemental Fig. 2). All three avian GITR molecules exhibit high identity levels with chGITR (helmeted guineafowl 84.1%, Japanese quail 82.9%, and turkey 85.3%) and similarly display the conserved residues shared between chicken and human GITR. The ligand, chGITRL, was identified on chicken chromosome 8 because of its conserved genomic localization adjacent to OX40L, FASLG, and the TNF-unrelated genes PRDX6 and TADA1 (Supplemental Fig. 3). BLAST searches with the mRNA and the putative protein sequence of chGITRL demonstrated similarity to TNFSF18 mRNA and protein sequences of different mammalian species (e.g., human, cattle, dog) as well as of other birds (e.g., South African ostrich) and reptiles (e.g., western painted turtle). We observed comparatively high identity levels of the putative GITRL nucleotide sequence to those of currently unannotated genes in turkey (100% query cover, 85% identity) and domestic swan goose (100% query cover, 74% identity), which adjoin the gene of TNFSF4, as observed in humans and mice. chGITRL exhibits the features of a classic type II transmembrane protein with an N-terminal cytoplasmic domain (20 aa), a transmembrane region (23 aa), and a C-terminal extracellular domain (138 aa) (Fig. 2). The full-length sequences of the depicted species comprise 181 (chicken), 177 (human), and 173 (mouse) residues, respectively. The chicken ligand shares only ∼21.3% sequence identity with its human and ∼18.1% with its murine counterpart. Nevertheless, it equally holds a predominantly hydrophobic extracellular domain, which is considered to be crucial for trimerization in mammals (36). Amino acid sequence alignment for GITRL. Cytoplasmic (CY), transmembrane (TM), and extracellular (EC) domains are. indicated, and species are denoted as ch, chicken; hu, human; mo, mouse. Conserved residues are shaded in gray; asterisks (*) indicate residues sharing similar properties. Accession numbers (https://www.ncbi.nlm.nih.gov/): chGITRL MH492024, huGITRL AAD22634.1, and moGITRL NP_899247. To further explore the interaction of GITR and its ligand, we cloned and expressed both genes. chGITRL was successfully cloned from cDNA of the HD11 macrophage cell line. Its extracellular domain was subsequently expressed as a soluble, FLAG-tagged form by stably transfected Cos-7 cells. Its binding partner chGITR was cloned from cDNA of Con A–stimulated lymphocytes and expressed as a surface-bound, Myc-tagged variant on HEK 293 (293-GITR-Myc) cells. As the receptor construct additionally encoded for GFP under a discrete promotor, the efficiency of the transfection could be monitored. 293-GITR–Myc cells were used to assess the interaction with the recombinant soluble form chGITRL-FLAG via flow cytometric analysis. To ensure surface-expression of the chicken receptor, the cell line was screened for its Myc-tag expression with the mAb 9E10 in combination with GFP signals (Fig. 3A). Analysis revealed that virtually all cells were double positive for 9E10 and GFP. For the staining with the soluble ligand (Fig. 3B), we used two negative controls. Whereas an unrelated FLAG-tagged protein in combination with secondary mAb or the sole application of the secondary mAb both yielded no positively stained cells, GITRL-FLAG recognized nearly all GITR-Myc–expressing cells. Soluble GITRL-FLAG and mAb 9C5 recognize 293-GITR–Myc cells. (A) Surface expression of GITR-Myc on stably transfected HEK 293 cells. Staining control of GITR-Myc+GFP+–transfected cells (left panel). Recognition of the Myc-tag of GITR-Myc+GFP+–transfected cells by the mAb 9E10 (anti-Myc) in combination with GFP signal confirming surface expression (right panel). (B) Soluble rGITRL-FLAG (left panel) and mAb 9C5 (right panel) recognize GITR-Myc+GFP+–transfected cells. To characterize chicken γδ T cells more intensively, we generated novel mAbs by immunizing mice with in vitro–stimulated chicken splenocytes. For this purpose, the latter were cultured for 1–2 wk with a combination of IL-2 and IL-12 selectively driving the expansion of γδ T cells (T.W. Göbel, unpublished observations). As GITR was reported to be extensively upregulated on activated T cells (4, 5) and was shown to contribute to cell proliferation and cytokine production of γδ T cells in mammals (7), chGITR was a suitable candidate as a potential target molecule on the surface of chicken γδ T cells. Therefore, we performed a primary screening of hybridoma supernatants on IL-2/IL-12–stimulated splenocytes to select reactive clones. The positive clones were further screened on 293-GITR–Myc cells. 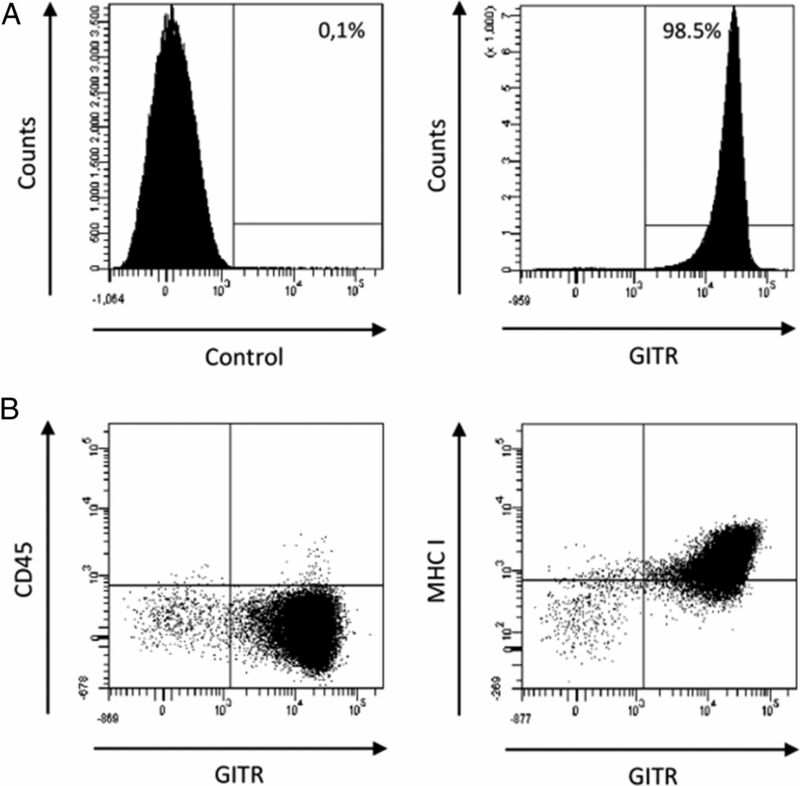 These flow cytometric analyses revealed the specificity of the mAb 9C5 (IgMκ) for chGITR-Myc (Fig. 3B). A control staining of 9C5 on 293-Myc–expressing cells excluded any unspecific binding to the c-Myc-tag. In conclusion, the 9C5 mAb is specific for chGITR. We subsequently employed the 9C5 mAb to analyze GITR expression on primary chicken leukocytes derived from different organs via flow cytometry (Fig. 4A, 4B). Expression of the GITR was detectable on a small subset of living lymphocytes in different organs (i.e., bursal lymphocytes [mean ± SD: 8.0% ± 1.1%], splenocytes [2.1% ± 0.2%], thymocytes [5.7% ± 0.6%], and PBL [2.4% ± 0.2%]). Three-color staining of PBL (Fig. 5) displayed the presence of chGITR on a subpopulation of CD4+CD25+ T cells (10.4% ± 0.9%). GITR expression on primary chicken cells. (A) 9C5 staining of bursal lymphocytes. Staining control with an isotype-matched Ab (left panel) and with 9C5 (right panel). Percentages display the respective share in GITR+ cells. Numbers indicate the Mean Fluorescent Intensity (MFI) of the population displayed. (B–D) 9C5 staining of lymphocytes (right panels, respectively) derived from spleen (B), thymus (C), and blood [PBL (D)] as displayed in the graph titles. All markers were based on isotype-matched controls (left panels, respectively). Percentages display the respective share in GITR+ cells. GITR expression on CD4+CD25+ PBLs. Three-color staining of PBL using the mAb 9C5 (anti-GITR), 2–6 (anti-CD4), and 28–4 (anti-CD25). PBL were primarily analyzed for their CD4 and CD25 expression. Percentages denote the fraction of positive cells in the respective quadrants (left panel). CD4+CD25+ cells were subsequently analyzed for their GITR expression in comparison with an isotype-matched control (right panels). The percentage in the histograms displays the portion of positive cells of the CD4+CD25+ subpopulation. All markers were positioned according to isotype-matched controls. In addition, the examination of GITR surface expression on chicken PBL and PBMC via flow cytometry revealed a distinct population of GITR+ cells not expressing any markers such as CD3 (T lymphocytes), KUL01 (monocytes, macrophages), or the pan-leukocyte marker CD45. Sorting of these GITR+CD45−KUL01− cells, subsequent cell preparation via cytospin, and staining allowed for their cytological evaluation as erythrocytes (data not shown). Following flow cytometric analyses of chicken erythrocytes (Fig. 6) revealed that virtually all RBCs expressed GITR (97.2% ± 1.4%), which was further verified by double staining with the mAbs 9C5 and 16-6 (anti-CD45) or F21-2 (anti–MHC class I), respectively. As chicken erythrocytes are nucleated, they bear the MHC class I Ag as a surface marker but lack the leukocyte marker CD45. Double staining of erythrocytes gained from PBL affirmed that nearly the whole-cell population was GITR+ and also exhibited the MHC class I Ag but was CD45−. To further substantiate the expression of GITR on chicken RBCs, we performed PCR on cDNA of chicken erythrocytes to detect GITR expression on mRNA level. Visualization of the PCR product in an agarose gel revealed one specific band, corresponding to the DNA of the assumed full-length chicken GITR (827 bp; Supplemental Fig. 4). In conclusion, GITR is expressed on a CD4+CD25+ T cell subset and on virtually all erythrocytes. (A) The histogram displays 9C5 staining on erythrocytes (right panel) based on an isotype-matched control (left panel). The percentage demonstrates the portion of GITR+ cells. (B) Dot plots show the double staining of erythrocytes with the mAb 9C5, 16–6 (anti-CD45), and F21-2 (anti–MHC class I). Because of studies in mammals, which reported the massive upregulation of GITR upon T cell activation (4, 5), we assessed the kinetics of GITR expression on chicken splenocytes, which were either activated for 72 h with an immobilized anti-CD3 mAb to drive the expansion of both αβ (TCR2+ and TCR3+) and γδ (TCR1+) T cells (Fig. 7) or were stimulated by the cytokines IL-2 and IL-12 to selectively promote the proliferation of γδ T cells (Fig. 8). Cultured splenocytes were harvested at 0, 24, 48, and 72 h and stained with the mAb 9C5 for GITR surface expression. In both culture systems, GITR expression drastically increased within 72 h of activation from a low level (anti-CD3: 2.0% ± 0.1%; IL-2/IL-12: 2.2% ± 0.3%) at 0 h to a value of 67.4% ± 1.0% for anti-CD3 stimulation and of 73.9% ± 2.1% for IL-2/IL-12 stimulation at 72 h, respectively. Upon anti-CD3 treatment, the fraction of GITR+ cells gradually expanded (0 h: 2.0% ± 0.1%; 24 h: 37.8% ± 0.5%; 48 h: 62.4% ± 2.0%; and 72 h: 67.4% ± 1.0%), whereas GITR+ cells already represented the prevailing cell population after 24 h (67.0% ± 0.1%) in the γδ T cell culture and exhibited only a moderate numeral increase within the ensuing hours (48 h: 70.4% ± 1.1%; 72 h: 73.9% ± 2.1%). To further characterize the GITR-expressing cells, we performed double immunofluorescent analyses applying additional markers, namely TCR1, TCR2, TCR3, CD4, and CD8. Figs. 7B and 8B depict the results of double staining at 72 h of stimulation with anti-CD3 mAb (Fig. 7B) or IL-2/IL-12 (Fig. 8B), respectively. In chickens, activation of splenocytes with plate-bound anti-CD3 resulted in the expansion of αβ (TCR2+ and TCR3+) as well as γδ (TCR1+) T cell subsets, comprising both CD4+ and CD8+ cells. After 72 h of stimulation, the majority of αβ and γδ T cells were also GITR+, in which the double-positive subpopulations made up 27.3% for TCR1+GITR+, 26.7% for TCR2+GITR+, and 11.6% for TCR3+GITR+. Equally, the populations of CD4+ as well as of CD8+ cells were subdivided into a double-positive (CD4+GITR+: 41.1% and CD8+GITR+: 31.9%) and a GITR− subset (CD4+GITR−: 5.0% and CD8+GITR−: 16.7%). Kinetics of 9C5 staining on chicken splenocytes stimulated with immobilized anti-CD3 mAb. (A) Splenocytes stimulated with immobilized anti-CD3 mAb were analyzed for their GITR expression by flow cytometry at different times as indicated. Percentages display the share in GITR+ cells. (B) Double staining of splenocytes at 72 h in culture with anti-CD3 mAb. Cells were analyzed for their GITR expression in combination with different mAbs as indicated. Percentages display the fraction of positive cells in the respective quadrants. All markers comply with isotype-matched controls. Kinetics of 9C5 staining on chicken splenocytes stimulated with IL-2 and IL-12. (A) Splenocytes stimulated with IL-2 and IL-12 were analyzed for their GITR expression by flow cytometry at different times as indicated. Percentages display the fraction of GITR+ cells. (B) Double staining of splenocytes at 72 h in culture with IL-2 and IL-12. Cells were analyzed for their GITR expression in combination with different mAbs as indicated. Percentages display the portion of positive cells in the respective quadrants. All markers comply with isotype-matched controls. Following IL-2/IL-12 stimulation, the second culture of activated splenocytes was dominated by γδ T cells and contained only a small fraction of CD4+ cells. The greater number of the TCR1+ cells, namely 66.8%, displayed GITR expression. However, some GITR+ cells could be likewise detected in the minor subpopulation of remaining αβ T cells (TCR2+GITR+: 3.0% and TCR3+GITR+: 1.5%). Only a fraction of the few existing CD4+ cells was double positive (1.0%), whereas the great majority of CD8-expressing cells (56.8%) exhibited the GITR. Taken together, these results indicate that activation induces the upregulation of GITR on T lymphocytes. Chickens represent a popular model organism to study the conservation (and the functional properties) of innate and adaptive immune responses during the evolutionary process and to improve the understanding of their functions in mammals. Over the last decades, a great number of studies dealt with the evolution of molecules related to the TNFR and ligand superfamilies and highlighted their structural and functional similarities among species (37). Apart from studies in humans and mice, however, information on the costimulatory TNF superfamily members, especially on GITR and GITRL, remains scarce (38). With respect to chickens, up to now, the chicken homologs of CD30 and OX40 and of their ligands CD30L and OX40L remain the only costimulatory representatives that have been described so far (24, 39, 40). Both receptor–ligand pairs have conserved their main characteristics among chickens and mammals. In general, we can also confirm this phenomenon for chGITR and its ligand chGITRL. As reported for other chicken TNF members, like chTACI (41), the genes of chGITR and chGITRL preserved their genomic association with OX40 (chromosome 21) and OX40L (chromosome 8) among avian and mammalian species, respectively, in agreement with the assumption that GITR and OX40 as well as GITRL and OX40L originated from gene duplication in a vertebral ancestor (8). Whereas avian nucleotide and protein sequences display high identity levels among each other, the comparison of the putative chGITR and chGITRL proteins with their human and murine equivalents revealed only weak similarity in amino acid sequence (chGITR–huGITR: 27.5%, chGITRL–huGITRL: 21.3%). However, low sequence conservation to mammalian equivalents is relatively common for chicken molecules (21) and was also reported for other chicken members of the TNF superfamily, which are involved in T cell activation (24, 40). Additionally, the alignment of chGITR with different human TNFRSF members clearly revealed that chGITR shares the highest identity level with its human counterpart GITR. Despite these poor identity levels, both chGITR and chGITRL share the characteristic structural features of the mammalian TNFRSF and TNF ligand superfamily. Like its mammalian homologs, the putative chGITR exhibits three CRD in its N-terminal, extracellular domain, displaying TNFR-1– (CRD1), TNFR-3– (CRD2), and TNFR-4–like (CRD3) motifs (16). However, the chicken molecule, as the other avian homologs, possibly represents a more ancestral form of its mammalian counterparts, as it differs in the composition of its first CRD. Human and murine CRD1 lack a cysteine residue and accordingly exhibit an atypical arrangement of cysteines, which probably results in the formation of only one disulfide bond (16). Because of this aberrance from the classical organization of a pseudorepeat, the CRD1 of human and murine GITR is thought to hold only a minor functional role with respect to the ligand interaction. On the contrary, the first chicken pseudorepeat exhibits the canonical motif of six regularly spaced cysteines, probably forming the classic three disulfide bridges. Chicken CRD2 and CRD3, in turn, perfectly match the serial organization of the mammalian sequences, forming three and two disulfide bonds, respectively. In mammals, GITR is mainly reported to function as a costimulatory molecule in the process of T cell activation, supporting their proliferation as well as their effector functions (6). Upon ligand interaction, different TRAF proteins are essential components of the costimulatory signaling pathway, allowing for cell proliferation, cytokine production, and longevity (35). Like human and murine GITR (5, 17), the cytoplasmic region of chGITR exhibits a TRAF2 binding motif, suggesting a similar costimulatory role of chGITR during the formation of an immune response. Analysis of the ligand chGITRL revealed the structure of a type II transmembrane protein. Like its mammalian counterparts (42), chGITRL is a comparatively small member of the TNF ligand family and exhibits only a short intracellular domain. Because of its hydrophobic extracellular region, the chicken molecule may form noncovalent trimers and interact with its receptor in a 3:3 ratio, like it is suggested for human GITRL (16). Via flow cytometric analysis, we confirmed the capability of rchGITRL-FLAG to bind its surface-expressed, Myc-tagged receptor GITR. Analogously to the mammalian molecule (6, 43), chGITR can be detected on native, nonactivated lymphocytes, in which its expression is equally, comparably low. We noticed only minor levels of GITR on lymphocytes derived from the spleen, the thymus, or from peripheral blood. Additionally, we detected a modest GITR signal on bursal lymphocytes conforming to the findings of Shimizu et al. (43) who demonstrated GITR expression on murine B cells. Although naive effector T cells show only a weak GITR expression, it is constitutively expressed on CD4+CD25+ Treg at high levels in mammals (11). The extent of GITR expression on putative peripheral Treg in the chicken (10.4% ± 0.9%) was comparable to values reported for human Treg (15.1%) (44). Therefore, chGITR may also play a role in limiting the immune response to regain homeostasis after its initial share in promoting host defense. In analogy to mammalian studies, which investigated GITR mRNA expression following anti-CD3 activation (5, 17), we confirmed that chGITR is drastically upregulated on T lymphocytes upon activation. To assess the αβ as well as the γδ T cell subset, we performed two culture systems. Stimulation by the immobilized anti-CD3 mAb promoted the expansion of all three chicken TCR subsets (TCR1-3) as well as of CD4+ and CD8+ cells. Our culture of splenocytes with IL-2 and IL-12, in contrast, selectively favored the growth of the TCR1 cell fraction. In contrast to humans and mice, chickens rank among the species exhibiting high numbers of γδ T cells (45). Therefore, they represent a suitable species to further investigate the influence of the GITR–GITRL system on γδ T cell activation. Similar to reports in mammals (9), chGITR was rapidly upregulated in both culture systems within 24 h following activation. Interestingly, the two modes of stimulation resulted in different kinetics of GITR expression within 72 h of culture. Upon anti-CD3 treatment, GITR expression only gradually increased from a basal level of 2.0% ± 0.1−37.8% ± 0.5% after 24 h, 62.4% ± 2.0% after 48 h, and finally to 67.4% ± 1.0% after 72 h of culture. These results comply with mammalian studies, which demonstrate that GITR expression peaks within 24–72 h (13) and hence conclude that its costimulatory effects appear after the initial T cell priming (15), similar to OX40 and 4-1BB signals. Like reported by Kanamaru et al. (9) for mammals, the great majority of both chicken CD4+ and CD8+ subpopulations exhibited an increasing GITR expression within 72 h, following activation. In the IL-2/IL-12 culture, GITR expression already reached a comparatively high level 67.0% ± 0.1% after 24 h and only modestly increased to 73.9% ± 2.1% after 72 h of culture. Similar to mammalian studies, which suggest an elongated GITR expression for several days upon cell activation (15, 44), we detected GITR on long-term, in vitro–cultured chicken γδ T cells (data not shown). Double staining revealed that the CD8+ cell subset of γδ T cells expressed the GITR to a great extent. Previous work demonstrated (23) that CD8+ cells, which derive from IL-2/IL-12 culture, represent the subpopulation with the highest cytotoxic potential, suggesting that chGITR may promote effector functions of γδ T cells, as it is assumed in mammals. Gonçalves-Sousa et al. (7) demonstrated that the application of an anti-GITR mAb could partially restore proliferation and cytokine production of anergic γδ T cells in γδ:Treg cocultures. Moreover, γδ T cells, which were treated with the mAb, produced higher amounts of IL-17 and IFN-γ. Interestingly, we found GITR expression on chicken erythrocytes at high levels via flow cytometric analyses and detected its existence in erythrocytes on an mRNA level, applying PCR on cDNA of erythrocytes. We suspected erythrocytes as the source of the GITR signal in preparations of peripheral blood, because a comparatively small, CD45− KUL01− but distinctly 9C5+ fraction of cells could be reconfirmed in several stainings of PBL and PBMC preparations. By virtue of sorting and of subsequent cytology of these 9C5+CD45−KUL01− cells from PBMC, we identified them as remnant erythrocytes in the leukocyte preparations. To verify this finding, we selectively stained chicken erythrocytes with 9C5. Because no specific markers for chicken erythrocytes exist, we performed double staining of erythrocyte preparations with the mAb 9C5, F21-2 (anti–MHC class I), and 16-6 (anti-CD45, pan-leukocyte marker), respectively. As expected, erythrocytes were virtually all 9C5+ CD45− but exhibited the MHC class I Ag. The massive expression of GITR by chicken erythrocytes was rather surprising, as the mere number of erythrocytes, compared with the leukocyte population, implies an abundance of the GITR in blood. The functional impact of erythroid GITR on erythropoiesis, on homeostasis, or the formation and decline of an immune response remains unclear. However, this finding is consistent with other studies affirming active contributions of erythrocytes to immunological processes. About 60 y ago, Nelson (46) provided evidence for a direct role of RBCs in the development of immune complexes. Since then, several other groups proved immunological functions of erythrocytes across different vertebrate species, investigating nucleated (most nonmammalian vertebrates) as well as enucleated erythrocytes (mammals) (47) and revealing the involvement of TNF family members. Experiments in fish and chickens identified a TNF-α–like gene in erythrocytes of the channel catfish (Ictalurus punctatus) (48) and demonstrated that nucleated erythrocytes of chickens (Gallus gallus) and rainbow trout (Oncorhynchus mykiss) responded to the application of pathogen-associated molecular patterns (PAMP) with the synthesis of immunologically relevant mRNA transcripts (e.g., CCL4, IFN-α, and TNFR-like) (49). It was further shown that upon different stimuli, erythrocytes of the Atlantic salmon, rainbow trout, and chicken upregulated cytokines and secreted soluble factors (49–51), which were able to alter monocyte and macrophage activities (52). Likewise, the constitutive expression of different TLR as well as the upregulation of surface molecules like MHC class II and CD80 upon specific TLR triggering (51) on chicken erythrocytes further supported their immunological role and is in line with their expression of chGITR. Furthermore, different studies in ducks, sheep, mice, and humans demonstrated that autologous erythrocytes were able to promote T cell proliferation and longevity (53–55). Although the molecular mechanisms remain unclear, the participation of erythrocytes in the activation of monocytes, macrophages, and T cells may be related to the costimulatory properties of GITR and GITRL. Likewise, it is now well established that platelets, which are the second largest prevailing cell population in blood and were formerly thought to be functionally restricted to hemostasis and thrombosis, adopt immunological functions, particularly upon activation. Several members of the TNF superfamily, like CD40L, FASLG, LIGHT, TRAIL, and APRIL, are expressed by activated platelets as membrane-bound forms or as soluble factors (56–60) and seem to play an important role in platelets creating a proinflammatory microenvironment in the periphery and in recruiting leukocytes. Although most of these TNF members were reported to be drastically expressed upon activation (56), a modest expression of LIGHT was also detected on nonactivated thrombocytes (58), conforming with our findings for chGITR on RBCs. In chickens, several other immune-related molecules have been identified on thrombocytes [e.g., the immune-regulatory Ig-like receptors SLAMF4 (61), TREM-A1 (62), and the TNF family member CD40L (63)]. Following this example, GITR expression on chicken erythrocytes might also be involved in establishing a proinflammatory milieu in the periphery, because endothelial cells and APC were reported to express GITRL in mammals. For sure, investigation of chGITRL expression and functional studies on erythroid GITR are necessary to clarify the biological relevance of GITR expression on nucleated chicken erythrocytes. Nevertheless, erythroid GITR expression in chickens fits well into the concept of erythrocytes actively contributing to immunological processes. In summary, we identified the chicken homologs of GITR and its ligand, GITRL, and proved their interaction. Structural analyses of the putative proteins revealed the overall conservation of their molecular topology in comparison with their mammalian equivalents but suggested chGITR to be a more ancestral form because of its classic CRD1. By virtue of the mAb 9C5, we demonstrated that the expression pattern of chGITR generally agrees with its mammalian homologs, with the exception of its expression on chicken erythrocytes. Our results represent the basis to further investigate the biological significance of the GITR–GITRL system in chickens and to enlighten its role in the innate immune system and in T cell response. We thank Prof. P. Schneider (University of Lausanne, Epalinges, Switzerland) for kindly providing the variants of pCR3 vector and Dr. Sonja Härtle and Marina Kohn for technical support with cell sorting. This work was supported by Deutsche Forschungsgemeinschaft Grant 489/5-2. The sequences presented in this article have been submitted to the National Center for Biotechnology Information database (https:/www.ncbi.nlm.nih.gov/) under accession numbers MH492023 and MH492024. 2003. The TNF superfamily. Cytokine Growth Factor Rev. 14: 181–184.
. 1999. Identification of a novel activation-inducible protein of the tumor necrosis factor receptor superfamily and its ligand. J. Biol. Chem. 274: 6056–6061.
. 1997. A new member of the tumor necrosis factor/nerve growth factor receptor family inhibits T cell receptor-induced apoptosis. Proc. Natl. Acad. Sci. USA 94: 6216–6221.
. 2004. GITR, a member of the TNF receptor superfamily, is costimulatory to mouse T lymphocyte subpopulations. Eur. J. Immunol. 34: 613–622.
. 2010. 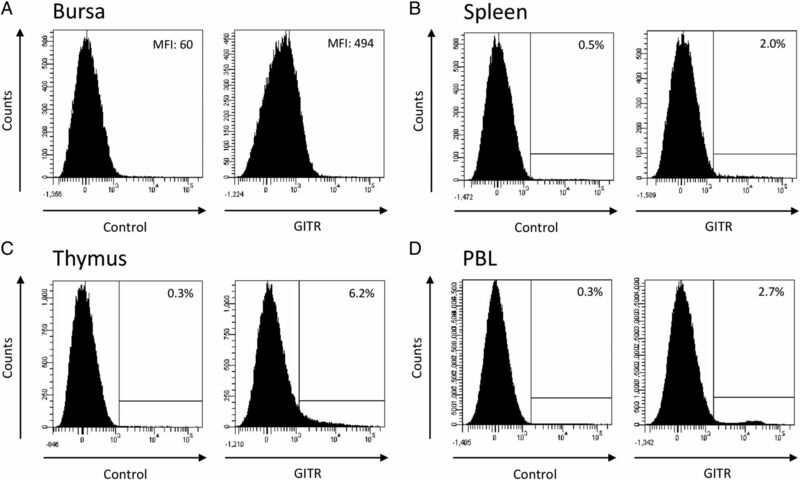 Inhibition of murine gammadelta lymphocyte expansion and effector function by regulatory alphabeta T cells is cell-contact-dependent and sensitive to GITR modulation. Eur. J. Immunol. 40: 61–70.
. 2014. Cell-specific and context-dependent effects of GITR in cancer, autoimmunity, and infection. Cytokine Growth Factor Rev. 25: 91–106.
. 2004. Costimulation via glucocorticoid-induced TNF receptor in both conventional and CD25+ regulatory CD4+ T cells. J. Immunol. 172: 7306–7314.
. 2002. CD4(+)CD25(+) immunoregulatory T cells: gene expression analysis reveals a functional role for the glucocorticoid-induced TNF receptor. Immunity 16: 311–323.
. 2012. Pharmacological modulation of GITRL/GITR system: therapeutic perspectives. Br. J. Pharmacol. 165: 2089–2099.
. 2015. Glucocorticoid-induced tumour necrosis factor receptor-related protein: a key marker of functional regulatory T cells. J. Immunol. Res. 2015: 171520.
. 2002. GITR interacts with the pro-apoptotic protein Siva and induces apoptosis. Cell Death Differ. 9: 1382–1384.
. 2012. Modulation of GITR for cancer immunotherapy. Curr. Opin. Immunol. 24: 217–224.
. 2007. GITR-GITRL system, a novel player in shock and inflammation. Sci. World J. 7: 533–566.
. 1999. Identification of a new member of the tumor necrosis factor family and its receptor, a human ortholog of mouse GITR. Curr. Biol. 9: 215–218.
. 2003. Mouse glucocorticoid-induced tumor necrosis factor receptor ligand is costimulatory for T cells. Proc. Natl. Acad. Sci. USA 100: 15059–15064.
. 2004. Engagement of glucocorticoid-induced TNFR family-related receptor on effector T cells by its ligand mediates resistance to suppression by CD4+CD25+ T cells. J. Immunol. 173: 5008–5020.
. 2010. A novel role for Glucocorticoid-induced TNF receptor ligand (Gitrl) in early embryonic zebrafish development. Int. J. Dev. Biol. 54: 815–825.
. 2005. A genomic analysis of chicken cytokines and chemokines. J. Interferon Cytokine Res. 25: 467–484.
. 2007. Chicken thrombocytes express the CD51/CD61 integrin. Vet. Immunol. Immunopathol. 119: 137–141.
. 2017. γδ T cells represent a major spontaneously cytotoxic cell population in the chicken. Dev. Comp. Immunol. 73: 175–183.
. 2018. Characterisation of chicken OX40 and OX40L. Dev. Comp. Immunol. 82: 128–138.
. 2015. Optimized sleeping beauty transposons rapidly generate stable transgenic cell lines. Biotechnol. J. 10: 647–653.
. 2017. Splenic γδ T cell subsets can be separated by a novel mab specific for two CD45 isoforms. Dev. Comp. Immunol. 77: 229–240.
. 1988. A large subpopulation of avian T cells express a homologue of the mammalian T γ/δ receptor. J. Exp. Med. 167: 315–322.
. 1988. Characterization and functional properties of a novel monoclonal antibody which identifies a T cell receptor in chickens. Eur. J. Immunol. 18: 533–537.
. 1989. TCR3: a third T-cell receptor in the chicken. Proc. Natl. Acad. Sci. USA 86: 2351–2355.
. 1993. Analysis of chicken CD4 by monoclonal antibodies indicates evolutionary conservation between avian and mammalian species. Hybridoma 12: 633–646.
. 1997. A novel peripheral CD4+ CD8+ T cell population: inheritance of CD8α expression on CD4+ T cells. Eur. J. Immunol. 27: 189–193.
. 2001. NK and T cells constitute two major, functionally distinct intestinal epithelial lymphocyte subsets in the chicken. Int. Immunol. 13: 757–762.
. 1998. Characterisation of chicken monocytes, macrophages and interdigitating cells by the monoclonal antibody KUL01. Vet. Immunol. Immunopathol. 61: 343–357.
. 1990. MHC-like molecules in some nonmammalian vertebrates can be detected by some cross-reactive xenoantisera. J. Immunol. 144: 2258–2272.
. 1999. The structural basis for the recognition of diverse receptor sequences by TRAF2. Mol. Cell 4: 321–330.
. 2002. The molecular architecture of the TNF superfamily. Trends Biochem. Sci. 27: 19–26.
. 2003. A co-evolution perspective of the TNFSF and TNFRSF families in the immune system. Trends Immunol. 24: 387–394.
. 2007. Early diversification of the TNF superfamily in teleosts: genomic characterization and expression analysis. J. Immunol. 178: 7955–7973.
. 2004. Marek’s disease is a natural model for lymphomas overexpressing Hodgkin’s disease antigen (CD30). Proc. Natl. Acad. Sci. USA 101: 13879–13884.
. 2004. Molecular cloning and characterization of chicken tumor necrosis factor (TNF)-superfamily ligands, CD30L and TNF-related apoptosis inducing ligand (TRAIL). J. Vet. Med. Sci. 66: 643–650.
. 2008. The BAFF-Interacting receptors of chickens. Dev. Comp. Immunol. 32: 1076–1087.
. 2008. Structural basis for ligand-mediated mouse GITR activation. Proc. Natl. Acad. Sci. USA 105: 641–645.
. 2002. Stimulation of CD25(+)CD4(+) regulatory T cells through GITR breaks immunological self-tolerance. Nat. Immunol. 3: 135–142.
. 2003. Expression of glucocorticoid induced TNF receptor family related protein (GITR) on peripheral T cells from normal human donors and patients with non-infectious uveitis. J. Autoimmun. 21: 83–92.
. 1999. Diversity and evolution of T-cell receptor variable region genes in mammals and birds. Immunogenetics 50: 301–308.
. 2011. Is there a direct role for erythrocytes in the immune response? Vet. Res. 42: 89.
. 2003. Molecular identification and expression analysis of tumor necrosis factor in channel catfish (Ictalurus punctatus). Dev. Comp. Immunol. 27: 845–858.
. 2011. RNA-seq reveals an integrated immune response in nucleated erythrocytes. PLoS One 6: e26998.
. 2008. Infectious salmon anaemia virus replication and induction of alpha interferon in Atlantic salmon erythrocytes. Virol. J. 5: 36.
. 2013. Chicken erythrocytes respond to Toll-like receptor ligands by up-regulating cytokine transcripts. Res. Vet. Sci. 95: 87–91.
. 2007. Antigenically activated avian erythrocytes release cytokine-like factors: a conserved phylogenetic function discovered in fish. Immunopharmacol. Immunotoxicol. 29: 141–152.
. 1997. Optimization of an in vitro assay which measures the proliferation of duck T lymphocytes from peripheral blood in response to stimulation with PHA and ConA. Dev. Comp. Immunol. 21: 299–310. 1985. Sheep red blood cells enhance T-lymphocyte proliferation. Clin. Immunol. Immunopathol. 37: 203–212.
. 1993. Enhancing effects of autologous erythrocytes on human or mouse cytokine secretion and IL-2R expression. Cell. Immunol. 148: 114–129.
. 1998. CD40 ligand on activated platelets triggers an inflammatory reaction of endothelial cells. Nature 391: 591–594.
. 2001. Activated human platelets express Fas-L and induce apoptosis in Fas-positive tumor cells. J. Leukoc. Biol. 69: 123–128.
. 2006. Platelet-derived LIGHT induces inflammatory responses in endothelial cells and monocytes. Blood. 108: 928–935.
. 2004. 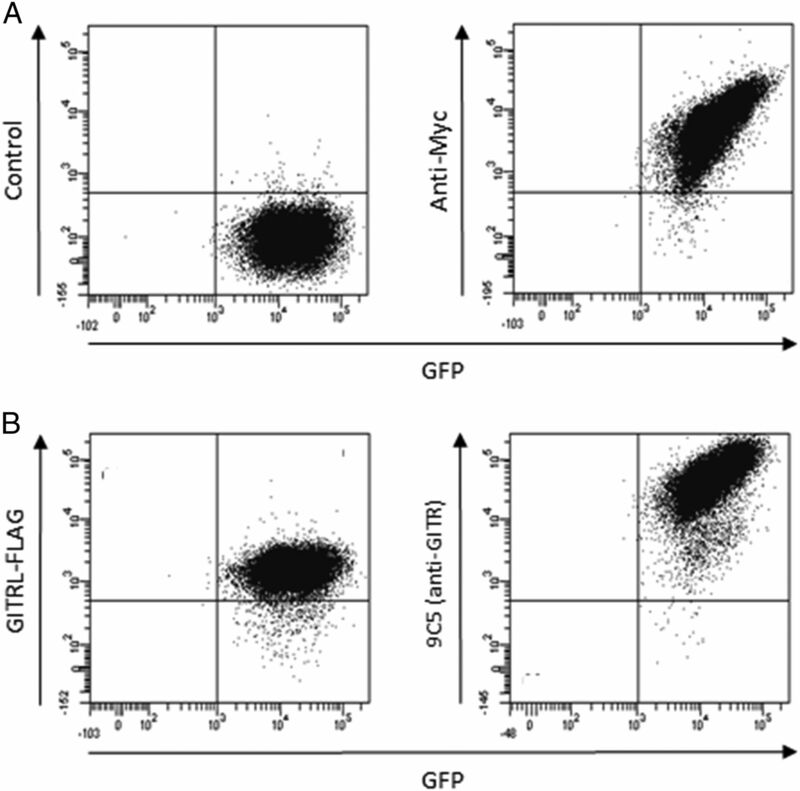 Expression of TNF-related apoptosis-inducing ligand (TRAIL) in megakaryocytes and platelets. Exp. Hematol. 32: 1073–1081.
. 2009. The tumour necrosis factor superfamily ligand APRIL (TNFSF13) is released upon platelet activation and expressed in atherosclerosis. Thromb. Haemost. 102: 704–710.
. 2014. Chicken SLAMF4 (CD244, 2B4), a receptor expressed on thrombocytes, monocytes, NK cells, and subsets of αβ-, γδ- T cells and B cells binds to SLAMF2. Dev. Comp. Immunol. 42: 159–168.
. 2013. Chicken immunoregulatory Ig-like receptor families: an overview and expression details on ggTREM-A1. Dev. Comp. Immunol. 41: 403–412.
. 2005. Conservation of biological properties of the CD40 ligand, CD154 in a non-mammalian vertebrate. Dev. Comp. Immunol. 29: 361–374.